Incidence of brachial artery (BA) injury is the third most common (20%) arterial injury after the popliteal and femoral artery. The major causes include gunshot, knife, broken glass, and iatrogenic injuries., Noniatrogenic injury includes large proportion of blunt trauma (47%) predominantly caused by motor vehicle accidents. It has been associated with proximal humeral fracture or shoulder dislocation in adults and humeral supracondylar fracture in children. It may also be caused by posterior dislocation of the elbow joint.,,, Arterial injuries from blunt trauma are caused by direct compression or by rapid deceleration which leads to intimal tear since the intima is the least elastic layer of the arterial wall. Therefore, blood dissects under the flap frequently causing thrombosis of the vessels. Reestablishment of arterial flow within 4–6 h after arterial injury minimizes the possibility of acute or permanents ischemia. Cases with bone injuries are diagnosed and referred earlier than 24 h. However, delayed presentation of BA injury after humeral shaft fracture has been little existed in literature worldwide. We report two cases of delayed BA presentation following humerus shaft fracture that was successfully treated and salvaged. A 24-year-old male right-handed dominant reported with a history of fall from vehicle after rollover of the same vehicle. He was presented with grossly deformed right arm and bleeding wound, 18 h after sustaining injury. First aid was given at nearby clinic in the form of compression bandage and intravenous fluid. The initial assessment was done as per Advance trauma life support guideline. Trauma computed tomography was promptly obtained which showed no abdominal, thoracic lesions and no head injury. The patient's overall health status was stable. Whole elbow, forearm, and hand were swollen. There was 13–15 cm deep wound over anterior surface of the arm, extended up to mediolateral aspects [Figure 1]a. Biceps muscle was fully and brachialis muscle was partially ruptured. The hand was pink, warm, and well perfused, and oxygen saturation was 80%–85%. There was pain on passive stretching of fingers. Vascular examination revealed absent radial, ulnar, and brachial pulse. Motor and sensory examinations were unremarkable. The standard radiographs revealed left humeral transverse shaft fracture. Gustilo type IIIC injury with compartment syndrome was diagnosed. After informed consent was obtained, the patient was taken to the operating room for debridement of wound, skeletal stabilization, and further assessment for vascular injury. Gross contamination, which included several pieces of grass or other organic material, was removed. The wound was then irrigated with 10 L of isotonic sodium chloride solution. Anterior compartment of the forearm was found tight. Fasciotomy was done and hematoma was removed to relieve pressure on neurovascular bundle [Figure 1]b. BA exploration was then carried out [Figure 1]c. The adventitia was intact with obvious underlying thrombus. Arteriotomy and thrombectomy was done by Fogarty catheter [Figure 1]d. Proximal flow was established and distal embolus was excluded. Radial and median nerve found intact. Skeletal stabilization was established using external fixator [Figure 1]e. End-to-end repair of biceps and brachialis was done. Fasciotomy was left open. At operation, intraoperative low molecular weight heparin (LMWH) 60 mg, deep subcutaneously twice a day, was started. Color Doppler study (CDS) showed biphasic color flow in distal BA, radial and ulnar artery, postoperatively. Subsequently, additional debridements were done and fasciotomy was closed after 1 week. LMWH was continued for 3 weeks then switched to oral aspirin 150 mg/day for 3 month. Split skin grafting was performed after 2 weeks. At 6 weeks all the wounds, pin tracts and split skin grafting found to be healthy. External fixator was replaced by anterograde intramedullary nailing (IMN). The patient was discharged at 8 weeks with the advice of gentle range of motion exercises of the shoulder and elbow. The patient was followed up 3 monthly in outpatient department up to 1 year. The flexion was 0°–80° at the elbow joint. Abduction and forward flexion at the shoulder joint was 0°–80° and 0°–110°, respectively. An inappropriate length of nail left outside at the proximal entry site was responsible for limited abduction in the shoulder joint [Figure 1]f, [Figure 1]g, [Figure 1]h. Humerus fracture showed satisfactory union [Figure 1]i and [Figure 1]j. A 39-year-old male right-handed dominant reported with a history of fall from bike after road traffic accident after 76 h after sustaining injury. He was presented with left arm pain, with blackening of middle and ring finger. Initially, he was managed at nearby hospital in the form of analgesics and POP splinting on the day of the accident. The patient's overall health status was stable. Whole limb examination revealed swelling in the arm, elbow, forearm, and hand. Multiple abrasions were present over the outer aspect of lower arm and elbow. Gangrene was present in middle and ring finger up to metacarpophalangeal joint [Figure 2]a. Tenderness was present over mid-arm. Vascular examination revealed absent radial, ulnar, and brachial pulses. Motor and sensory examinations were unremarkable. The standard radiographs revealed transverse fracture shaft humerus [Figure 2]b. CDS left upper limb showed absent flow in BA [Figure 2]c. Computed tomographic angiography (CTA) was revealed short-segment occlusion of BA with reconstitution of BA distally with collaterals surrounding occluded segment [Figure 2]d. Vascular surgeon consultation was sought and planned to stabilize skeletal injury first with IMN and vascular procedure thereafter. LMWH, 60 mg deep subcutaneously, twice a day was started. A surgical procedure was performed under scalene block anesthesia. The appropriate size nail was driven anterograde over the guide wire without reaming the medullary canal. Proximal interlocking was performed with the assistance of a nail-mounted drill guide. Two interlocking screws were used in order to enhance the stability of the fixation. Distally, one interlocking was performed by the free-hand technique by carrying out a limited dissection through a 5-cm incision to protect the radial nerve. BA was exposed at the elbow, transverse arteriotomy was done, and by Fogarty catheter, two inches organized thrombus was removed [Figure 2]e, [Figure 2]f, [Figure 2]g. Proximal flow was established, distal embolus was excluded by Fogarty embolectomy catheter, and the arteriotomy was closed with 6-0 prolene suture. Gangrenous fingers were left untouched as there was possibility of extension, proximally. CDS showed biphasic color flow in distal BA, radial and ulnar artery, postoperatively. Middle and ring finger amputation through the metacarpophalangeal joint was done 1 week after the vascular procedure. LMWH was continued for 3 weeks then switched to oral aspirin 150 mg/day for 3 months. The patient was discharge at 6 weeks with the advice of gentle range of motion of all joints of diseased limb. The patient was followed up 3 monthly in outpatient department up to 6 months. Mild Volkmann ischemic contracture was appreciated. Abduction and forward flexion at shoulder was 0°–80° d 0°–110°, respectively. There was no limitation of range of motion at the elbow joint [Figure 2]h, [Figure 2]i, [Figure 2]j. Humerus fracture showed satisfactory union. In recent years, the limb salvage rate has reached nearly 100% because of early transport of patients to the hospital, early diagnosis, increased surgical experience, and developments in the treatment of hypovolemic shock and the use of antibiotic therapy.,, In the present study, cases were referred late due to lack of medical centers at nearby. Only two cases of delayed presentation of BA injury with fracture shaft humerus have been described before, similar to case no. 1 [Table 1]. Delay in case 1, was 18 h after injury, and in case 2, it was 76 h which was beyond the “golden period” of 6 h warm ischemic time, proposed by many authors to maximize limb salvage., Reestablishment of arterial flow within this period minimizes the possibility of permanents ischemia, which was developed by case 2 in the form of digital gangrene and subsequently Volkmann ischemic contracture. Although, there is no absolute period beyond which repair is contraindicated. The presence of distal cutaneous gangrene makes the benefits of revascularization questionable, but successful repair may preserve the viable tissue and permit amputation at a lower level. Delay was varied in reported similar studies without sign of permanent ischemia. Both reported cases had CTA confirmed occlusion of BA. We did not perform CTA in Case 1, as urgency the immediate exploration was mandatory based on physical findings and in keeping with previous studies suggesting that upper extremity arterial injury can be managed without angiography in open injuries but helpful in closed trauma. There is a controversy whether to perform combined, vascular repair followed by bony stabilization or vice versa. Combined soft-tissue coverage of the vascular repair and skeletal fixation helps to reduce the risk of graft infection, false aneurysm formation, or osteomyelitis., A retrospective review of 27 patients, 80% patients with skeletal fixation before revascularization required fasciotomy, whereas 36% patients with revascularization before fixation required fasciotomy, and this difference approached statistical significance (P = 0.10). They concluded that in combined injuries, priority should be given to revascularization before skeletal fixation because of a trend toward lower fasciotomy rates and shorter hospitalization. Revascularization before fracture fixation did not result in iatrogenic disruption of the vascular repair. In BA injury associated with fracture humerus, fixation of bone is mandatory and done before BA repair to protect vascular anastomosis, but whenever signs or ischemia or fixation was delayed >6 h, vascular repair should be done first. We have preferred revascularization first in case 1 and skeletal fixation in case 2. We did fasciotomy in case 1, as compartment syndrome signs were there and did not occur in case 2, hence fasciotomy was not done. Arteriotomy and thrombectomy was done in case 1, as in similar studies and transbrachial thrombectomy was done in case 2 to exclude distal embolus. Secondary thrombosis is the most common vascular injury from blunt trauma as intimal tear can be sustained when the artery is subjected to a significant traction force by direct compression forces over a displaced segment of bone. None of our cases had nerve involvement. BA injury is associated with median nerve injury in 42.88%. This is because that the anatomical course of the median nerve is closely related to the BA. In this series, we aimed at evaluating the likelihood of limb salvage, thus the case 2 was not followed up for a long period to assess the improvement of morbidity. Our results were good with minimal morbidity due to joint stiffness, restriction of range of motion, or complications of ischemia. These results were agreed with other studies.,, We recommend BA repair in delayed presentation following fracture shaft humerus even after the golden time of arterial repair. Written informed consent was obtained from the patient for publication and accompanying images. Orcutt MB, Levine BA, Gaskill HV, Sirinek KR. Civilian vascular trauma of the upper extremity. J Trauma 1986;26:63-7. Jagdish K, Paiman M, Nawfar A, Yusof M, Zulmi W, Azman W, et al. The outcomes of salvage surgery for vascular injury in the extremities: A special consideration for delayed revascularization. Malays Orthop J 2014;8:14-20. Fitridge RA, Raptis S, Miller JH, Faris I. Upper extremity arterial injuries: Experience at the Royal Adelaide hospital, 1969 to 1991. J Vasc Surg 1994;20:941-6. Byrd RG, Byrd RP Jr., Roy TM. Axillary artery injuries after proximal fracture of the humerus. Am J Emerg Med 1998;16:154-6. Crawford DL, Yuschak JV, McCombs PR. Pseudoaneurysm of the brachial artery from blunt trauma. J Trauma 1997;42:327-9. Gallucci G, Ranalletta M, Gallucci J, De Carli P, Maignon G. Late onset of axillary artery thrombosis after a nondisplaced humeral neck fracture: A case report. J Shoulder Elbow Surg 2007;16:e7-8. Endean ED, Veldenz HC, Schwarcz TH, Hyde GL. Recognition of arterial injury in elbow dislocation. J Vasc Surg 1992;16:402-6. Sabiston DC, editor. Disorders of the arterial system. In: Textbook of Surgery. 14th ed., Vol. 1. Philadelphia: W.B. Saunders Company; 1991. p. 1618-722. Cho CH, Bae KC, Lee KJ, Lee SW. Delayed brachial artery occlusion after humeral shaft open fracture: A case report. J Korean Fract Soc 2012;25:146-9. Hunt CA, Kingsley JR. Vascular injuries of the upper extremity. South Med J 2000;93:466-8. 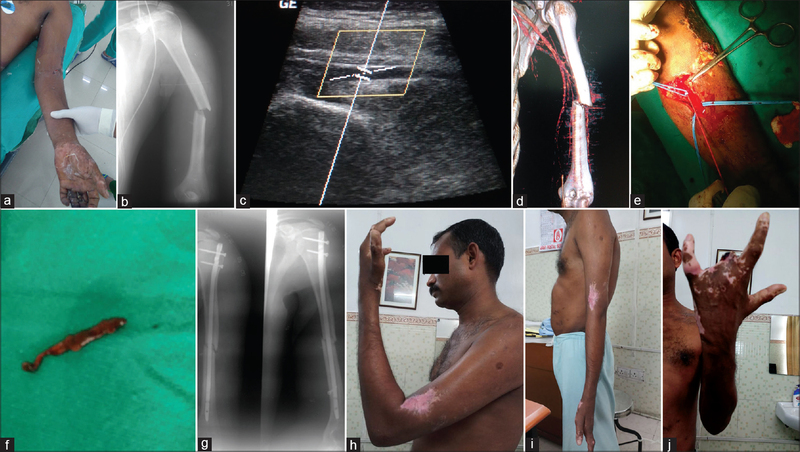 Shanmugam V, Velu RB, Subramaniyan SR, Hussain SA, Sekar N. Management of upper limb arterial injury without angiography – Chennai experience. Injury 2004;35:61-4. Ergunes K, Yilik L, Ozsoyler I, Kestelli M, Ozbek C, Gurbuz A, et al. Traumatic brachial artery injuries. Tex Heart Inst J 2006;33:31-4. Kaoru TA, Yamamoto D, Nakajima T, Nakada M, Tsuchiya H. Gustilio III C fracture of the humerus with a long vein graft: A case report. J Jpn Soc Reconstr Microsurg 2017;30:65-8. Fox N, Rajani RR, Bokhari F, Chiu WC, Kerwin A, Seamon MJ, et al. Evaluation and management of penetrating lower extremity arterial trauma: An Eastern association for the surgery of trauma practice management guideline. J Trauma Acute Care Surg 2012;73:S315-20. Pillai L, Luchette FA, Romano KS, Ricotta JJ. Upper-extremity arterial injury. Am Surg 1997;63:224-7. Gainor BJ, Metzler M. Humeral shaft fracture with brachial artery injury. Clin Orthop Relat Res 1986;204:154-61. McHenry TP, Holcomb JB, Aoki N, Lindsey RW. Fractures with major vascular injuries from gunshot wounds: Implications of surgical sequence. J Trauma 2002;53:717-21. Snell RS. Clinical Anatomy for Medical Students. 3rd ed. Boston, Toronto: Little, Brown, and Company; 1986. p. 456-8. Andreev A, Kavrakov T, Karakolev J, Penkov P. Management of acute arterial trauma of the upper extremity. Eur J Vasc Surg 1992;6:593-8.